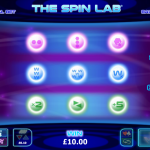 The Spin Lab is the latest addition to the NextGen Gaming portfolio. The game itself has the power to instantly transport you into a lab where you can see and experience firsthand how it looks like to be a scientist, mixing chemicals and changing the structure of the DNA. The sound effects perfectly match the theme and enhance your experience. 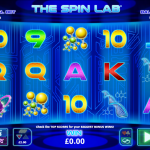 The Spin Lab offers something revolutionary when it comes to the special features. But before we jump to that, let`s see what the wild can do too. The multicolor icon is the wild and it stands in for every other symbol, except for the scatter, to complete a winning line. The silver glowing ball is the scatter and if you manage to land at least 3 of them you will activate the free spins round. Now this is where all the fun starts. You will receive 5 free spins initially but you can upgrade those spins the way you want. In the first row you have to choose how you want the symbols to act, then in the second row, you can choose how you want the wild to act and in the third row you have the chance to choose 5 more free spins, a multiplier or wins that pay both ways. 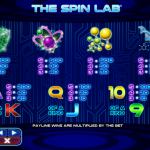 The Spin Lab is definitely one of those games that you have to try. It is a sci-fi themed video slot game and NextGen Gaming did a great job creating it. The game play is interesting and the best part of it was the free spins round. We all know from experience which combination can pay the most so we can choose the one that we like. Not many games offer this, and for that reason this is a unique game that is worth the try. For another great engaging game you should consider playing The Snake Charmer a 5 reel slot by NextGen.